With the coolness of late summer in the air, the hydrangeas are in their glory, their big white blooms tinged with pink. In early morning, I took a walk up the road to where a neighbor has them growing in a row by the roadside. He's an elderly gentleman, but is out every day tending the gardens. His hydrangeas are beautiful! 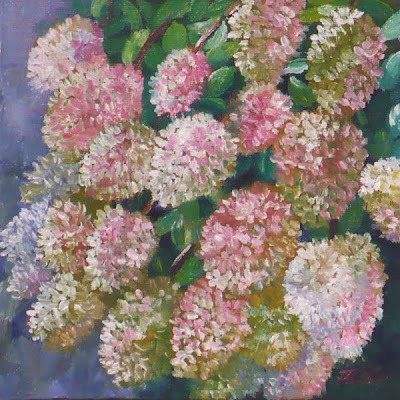 I also paint hydrangeas in watercolor on occassion -- I have to tell you that you did a great job on these! Krys, I like painting them in watercolors as well. It's totally different, of course. Thanks for the nice comment!